Now in it's third year, Santa Paws Drive is the first "virtual toy drive" for pets! Donate either cash or gifts and the goodies will go to six shelters across the world! Bring some good cheer to homeless animals this holiday. 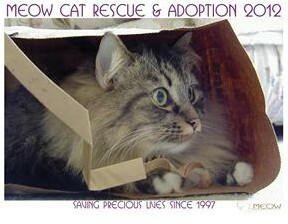 You can purchase the 15th Anniversary Issue MEOW Cat Rescue and Adoption calendar 2012. It features gorgeous kitties from MEOW cat rescue in Kirkland, WA. Honor a pet companion or a loved one who was a pet person. Make a donation to the non-profit, no-kill, volunteer-driven Orphan Animal Rescue and Sanctuary in Neenah, WI, and the shelter will post your pet or person's photo on their webpage. Want to make some pet treats? Chef Jack the cat will show you how in his new book, Operation Cookin' with Jack . The cookbook proceeds will go to support the nonprofit Feline Rescue and Rehome in Little, Rock, Arkansas. Petfinder has a number of articles and questions to ask about fostering animals before you begin. 9. A click of your mouse--it's so easy! Visit the Animal Rescue site and Click on the purple "Click Here to Give - it's FREE" button on the home page. You'll help feed and care for rescued animals. Bowls of food are paid for by The Animal Rescue Site's sponsors. And you can even shop their store to give more. Help feed hungry cats and dogs. Go to the freekibble site and answer the trivia questions. The organization will send 10 pieces of kibble to animal shelters. And you can go to these sites every day! Many animal shelters have programs where you can sponsor a rescue cat or dog, some with special needs. You can make a big difference in their lives. Anjellicle Cats a non-profit, no kill, all volunteer organization in New York City offers 4 levels of sponsorship for kitties including: Feline Friendly, Cat Lady, Lion Tamer and Guardian Angel. 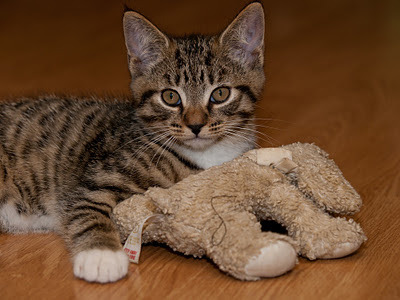 The rescue will send you photos and updates of your chosen kitty. You can support a shelter by donating your used car and receive a tax deduction. You can help the non-profit Baltimore Animal Rescue Care Shelter through your used vehicle donation. In addition to cars, you can donate trucks, vans, boats, motorcycles, jet skis, snowmobiles, RVs, and even airplanes! Animal shelters can always use money to continue their valuable work. A check for any amount or a gift card to a PetSmart or Petco is appreciated. Oh it's a great list of things we can do! I want to do everything I can to help homeless animals..and I hope many of them are adopted soon to have happy holiday with their new family. Oh, how lovely! As a former rescue, I thoroughly approve! We do everything we can affford to do for local rescue groups. A friend of mama fosters. I have given to a local shelter in the name of friends for Christmas and birthdays. I love your list. Thank you for the reminder. Shelters often need blankets this time of year too. A friend of mine had the idea of going to a non-profit thrift shop to buy blankets and towels for the animals shelters. It's a way to support 2 groups. What a great list of things people can do to help the shelters. We might have to get some of that dark chocolate. Also the cook book looks great. I would like to advertise that on my blog. That looks really good. Thanks so much for visiting our blog. We are so glad to find you. I hope you don't mind if I snitch the picture for the cook book. Thanks for posting about all these things. Excellent!!! Everyone should do at least one and the world would be a better place! I am makin' the Human send a big ole check this year--this is a great list. Thanks for dropping by today! Thank you, Ann, for including PAWS -- what a wonderful surprise! My first "stop" this year was at Rescue Chocolate's website and the benefactor was... PAWS of Norwalk, CT! As meowmeowmans said, we really appreciate your support, Ann!